HDB prices cannot drop more than private home prices? 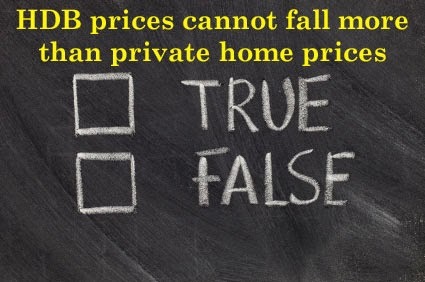 Someone said in a recent discussion within the "Comment" section of our blog that it is unlikely for HDB prices to drop more (in % terms) than private home prices if the property market crashes. To which, the wife and I responded that we will not discount totally that HDB prices may drop more % wise but we were unable to quote actual historical data then to substantiate our claim. This is because we have not been keeping up with developments on the HDB price front. The private residential index for non-landed properties fell 1.3% in Q1 2014 from Q4 2013. The was followed by a further drop of 1.1% in Q2 2014 from Q1 2014. The HDB resale price index registered a 1.6% decline in Q1 2014. This was followed by a further 1.3% drop in Q2 2014. The fall in price was across all 3 to 5-room property types over the 2 quarters. According to one market expert, private property prices are expected to drop 3% in the second half of the year to bring about a correction of 5% in 2014. With HDB prices, the same expert expects a similar drop of 3% for the second half of 2014, giving a total decline of 6 - 8% for the whole of 2014. Actual market data have shown that HDB prices had indeed fallen sharper than private home prices for the past 2 consecutive quarters. While we are not anywhere near a "market crash" yet, we cannot eliminate the possibility of HDB prices dropping more than their private counterparts if market do fall sharply. No Comment to " HDB prices cannot drop more than private home prices? "